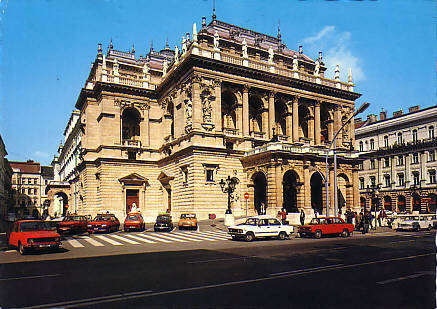 Built 1875-1884 as "Királyi Operaház" (Royal Opera House) by Miklós Ybl. 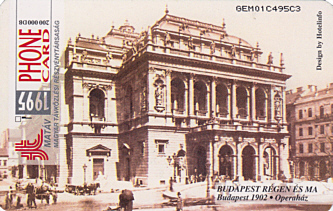 Opened 27 September 1884 with an opera gala with music by Erkel and Wagner. 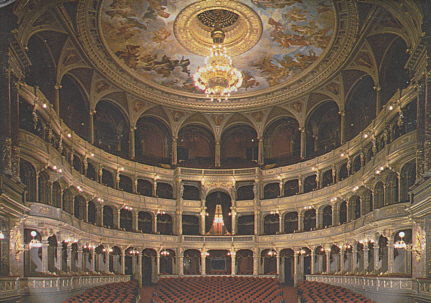 The theatre had the first hydraulic sinkable stage in Europe. Exterior damaged in World War II. Re-opened 1945. 1950 auditorium renovation and slight alterations (new light system, new curtain, addition of 25 rows of seats) by Oskar Kaufmann. 1979-1984 and again from 2019 major renovations. 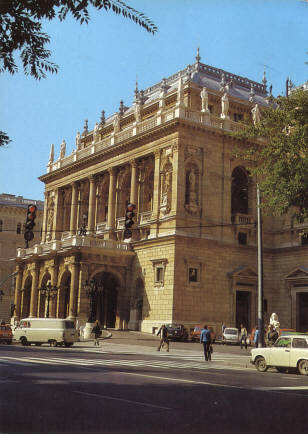 Used for opera and ballet performances by the resident companies. 1277 seats. 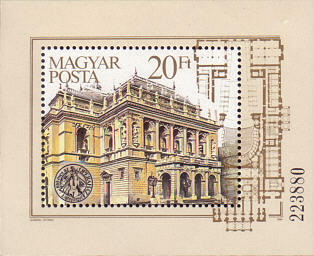 Front Text: "Budapest : Magy. 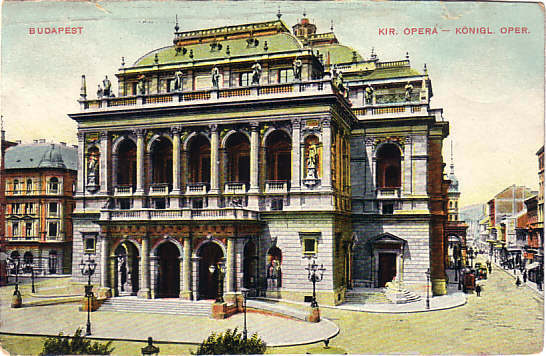 kir operaház - Königl. Oper"
Handwritten Front Text: a postcard collector asking for a card in exchange - in a rhymed poem: "Gern wirk' ich mit, Ihr Album füllen / Und Ihre Sammlerlust zu stillen. / Doch ist Revansche hier Gebrauch, / Drum merken Sie: 'Ich sammle auch'!" 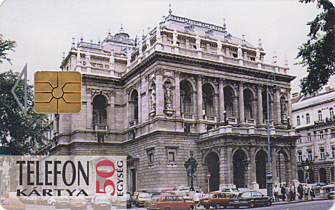 Reverse Text: "Budapest, Királyi operaház - Königl. ung. 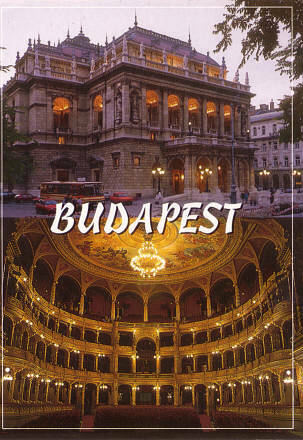 Oper"
Front Text: "Budapest - Kir. 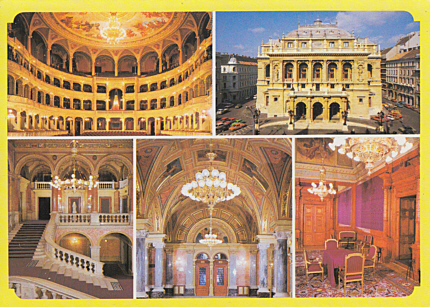 Opera - Königl. 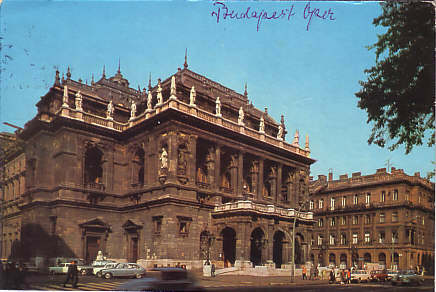 Oper"
Reverse Text: "Budapest - Operaház, Opernhaus, Opera house, Opernyi Teatr"
Reverse Text: "Budapest - Magyar Állami Operaház, 1875-1884 (Ybl Miklós) - Ungarisches Staatsopernhaus - Hungarian State Opera House"
Reverse Text: "Budapest - Magyar Állami Operaház (1875-1884. 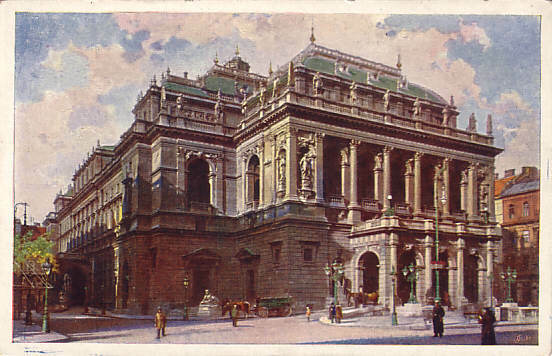 Ybl, Miklós) - Ungarisches Staatsopernhaus - Hungarian State Opera House"
Text: "100 évez az Operaház"
Reverse Text: "Budapest, Magyar Állami Operaház 1875-1895 (Ybl, Miklós) - Ungarisches Staatsopernhaus - Hungarian State Opera House - Budapesht, Vengerskaya Gosudarstvennaya Opera"
Reverse Text: "Nézötér. Auditorium. Zuschauerraum. Salle des spectateurs. Zritelny zal." 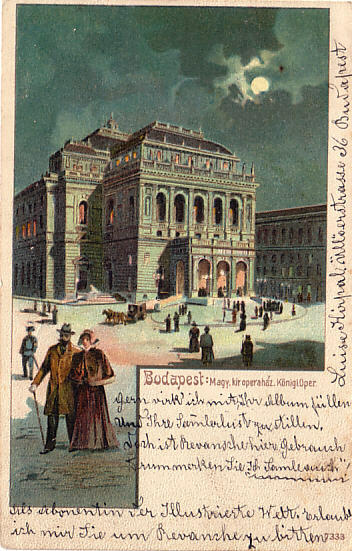 Reverse Text: "Budapest, Magyar Állami Operaház, The Opera House, Die Ungarische Staatsoper"
Front Text: "Budapest Reggen és ma. Budapest 1902 - Operaház"